Additional production assistance by Deborah Block, Debbie Callen, Kara Graves, Delaine Hackney, Celeste Howell and Rachel Rodi and Lillian Sizemore. 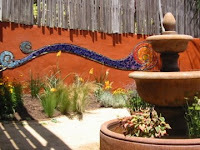 Handmade ceramic tile accents by Saundra Warren. Project conceived by Santiago Rodriguez. Production assistance by Randi Casenza, Jack Dynis and Ben Otis Dugger. The Wedding Cake Project was created at the 580 Hayes Market Gallery in San Francisco as a performance art piece. The final product, a giant, 6 foot diameter, double layer, sculptural mosaic cake, will be sited at City Hall in San Francisco to celebrate marriage and all unions of love. 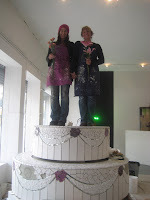 Couples are invited to stand on the cake and become part of the artwork, as the artwork becomes part of the celebration of marriage. Community Mosaic Mural done in New Orleans Bywater neighborhood in May 08. Mosaic Suns are DONE! Finally.